Summary (from the inside flap of the book): Nadia stands at the center of attention in her parents' elegant dining room. This is the best day of my life, she thinks. Everyone is about to sing "Happy Birthday" when he uncle calls from the living room, "Baba, brothers, you need to see this." Reluctantly, Nadia follows her family into the other room. On TV, a reporter stands near an overturned vegetable cart on a dusty street. Beside it is a mound of smoldering ashes. The reporter explains that a vegetable vendor in the city of Tunis burned himself alive, protesting corrupt government officials who have been harassing his business. Nadia frowns. It is December 17, 2010: Nadia's twelfth birthday and the beginning of the Arab Spring. Soon anti-government protests erupt across the Middle East and, one by one, countries are thrown into turmoil. 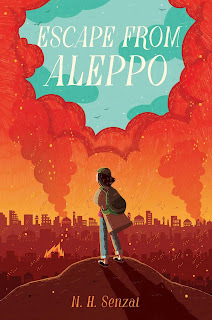 As civil war flares in Syria and bombs fall across Nadia's home city of Aleppo, her family decides to flee. 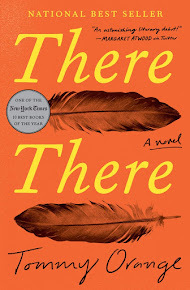 Review: If you are a frequent visitor to this blog you know I love books set outside the United States and wish teens read more of them. I think we can learn so much from reading novels set overseas: culture, history, our differences, and our similarities. Years ago I read NH Senzai's Shooting Kabul and loved it. This book is well written and super accessible for middle grade students while appealing to high school-aged teens as well. Who wouldn't get caught up in an escape story while bombs are going off, rebels and military soldiers show up on every street corner, and there isn't enough to eat?! Nadia and her family are caught in a bomb blast and the family has to leave her behind. Nadia is old enough and desperate enough to make her way across her war-torn city to escape to Turkey. Along the way she meets up with a small group of likable characters, who each bring comfort and support along the way. Her cat and the donkey that pull their cart add to the appeal. Syria and its civil war have been in the news for far too long and this novel helps to humanize that story. I learned about Syria, it's history, the looting of artifacts, and a bit about the current regime and I like that about a novel: learning without feeling like one is reading a stale non-fiction.